It's funny. I think that my vision of myself differs from reality. My family is taking a course of DBT or dialectical behavioral therapy, and I am learning so much. In one lesson we learned that it's no good to ask for directions from Chicago if you live in Detroit but are simply in denial about it (apologies to my east side friends). Your directions won't work unless you are realistic about where you live. Well, I seem to have this idea about myself that I appreciate simple patterns. Realistically, I can't help but complicate things. 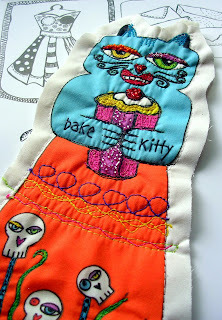 I was going to just stuff these dolls, but I find myself embroidering them and beading them into oblivion. I may love to look at a spartan zen garden, but I'm more of a blowsy, overgrown garden myself. I can appreciate them in their simple state, but my hands must be from Detroit. 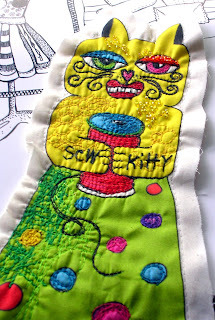 I may try to stitch some up that are not embellished, but I'm going to have to admit that I am never going to create much that's not busy busy busy. If I have to ask for directions, I'm from busy (Detroit), not from elegantly simple (Chicago). Darnit. I'd hate to end up in Poughkeepsie when I was trying to go to Seattle. These are charming! Love all the color. You can admire many different styles without wanting to emulate them. Your style is definitely your own. These are gorgeous, just like you. 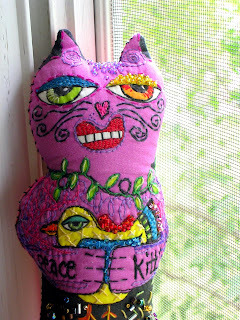 I am currently in an online quiltie swap and am trying to make quilties to fit other swappers' styles and tastes. Its good to have a challenge, but it also makes me appreciate those things that really make my heart sing. Embrass your soul. You inspire me. 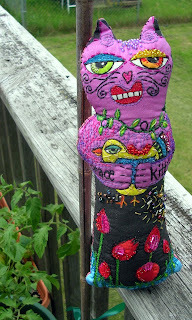 I love colorful and whimsey - you got it! 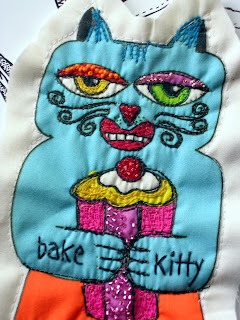 The Bake Kitty - what are you doing with the stitched outline? all that extra texture ads so much interest, they look awesome. I can totally relate to what your saying. I have so often admired work that has lots of stitching and beadwork and have wanted to add it to my work, but every time i have tried, I end up taking it all off, it just doesn't look right. I think you just got to do what you do and then when you see the work of someone else's that is the opposite, you can love and admire it all that much more. I have been admiring yur work to the point that I'm sitting on pins and needles until Sept arrives and your book is available. Meanwhile, I think I will check out Spoonflower! and i use dbt at work!